It's always better when homemade! These Red Wine Chocolate Covered Cherries are delightful! Combine sifted powdered sugar, butter, sweetened condensed milk, and wine until well blended and smooth. (It is best to use a handheld mixer here) Place in fridge until firm. Meanwhile, spread out the drained cherries on a cookie sheet and freeze for at least 1 hour. Place on a parchment lined cookie sheet and freeze for 1 hour after you have formed them all. Melt semi-sweet chocolate in a microwave safe bowl. Heat for 1 minute, stir, then heat in 15-second increments until smooth. 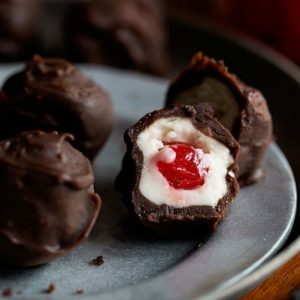 Using a fork, dip each chilled filling covered cherry in warm chocolate. Shake until excess chocolate is removed. Set on the parchment lined cookie sheet and chill in the fridge until chocolate is solid.